In honoring the civil rights movement, we sometimes forget the battles that took place in northern cities like New York. On February 3, 1964, the Rev. Milton Galamison led the largest student boycott in the history of the New York City public school system, with 464,361 students staying home to fight for the end of school segregation. Galamison, a pastor at Siloam Presbyterian Church and a member of the Brooklyn NAACP, had a lengthy history of civil disobedience, primarily relating to education issues and pushing for blacks and Puerto Ricans to be hired for city construction projects. Fed up with the slow rate of school integration ten years after the Supreme Court’s decision in Brown v. Board of Education, Galamison teamed up with Annie Stein, a white communist PTA leader, to organize a single-day boycott. The coalition enlisted legendary organizer Bayard Rustin, who had just organized the March on Washington, to run point for the boycott. Response to the boycott call was overwhelming. Parents in more than 300 schools kept 464,361 students out of the classroom during a day of action that featured hundreds of “Freedom Schools” taught black history and sang freedom anthems. Galamison firmly believed that without addressing equality in education, minorities who already suffered from racial discrimination would never have a chance in the job or housing market. At this time, he believed equality in education would be satisfied by integrating white school and constructing new school buildings in predominantly black neighborhoods. After hearing no response to his demands from the Board of Education, Galamison called for another boycott on March 16. 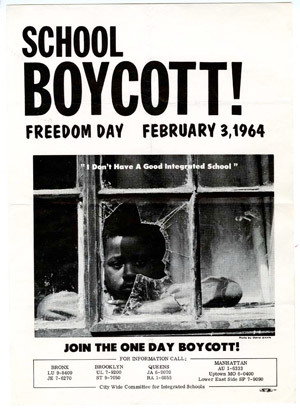 The rhetoric around this boycott reflected the increasingly nationalistic position of the activists like Malcolm X, who favored separate schools for blacks celebrating black heritage rather than integration, and was opposed by mainstream groups like the NAACP. Nevertheless, 267,459 students participated in the second boycott. Mayor John Lindsay’s administration was more receptive, leading to the controversial Ocean Hill-Brownsville experiment, in which a school district in a black neighborhood was decentralized and briefly permitted to pursue its own black nationalist curriculum. More on that in May, on the anniversary of the resulting teacher strike. Galamison, who had remained involved in the education movement until then, returned to focusing on his church after Ocean Hill-Brownsville. Obviously, many schools in New York City and across the country remain deeply segregated. We still have a long way to go in designing curricula that lift up all of the cultural groups that have built this country. Janos.nyc hopes to partner with local schools in the coming year on neighborhood history projects.